On October 16th, 2013 the “No to Silvertown Tunnel” campaign held a public meeting at The Forum in Greenwich to announce the results of our NO2 air pollution monitoring experiment. The following post features transcripts, slides and video from that meeting. Chris Taylor: Many thanks to everybody for bearing with us so far. I hope you’ve still got your questions stored up. First of all, we’d like to introduce Andrew Wood from Clean Air UK, the Network for Clean Air. He has given our campaign valuable support and guidance. My name is Andrew Wood, and I work with Network for Clean Air. We network people and communities for better air quality and less air pollution. 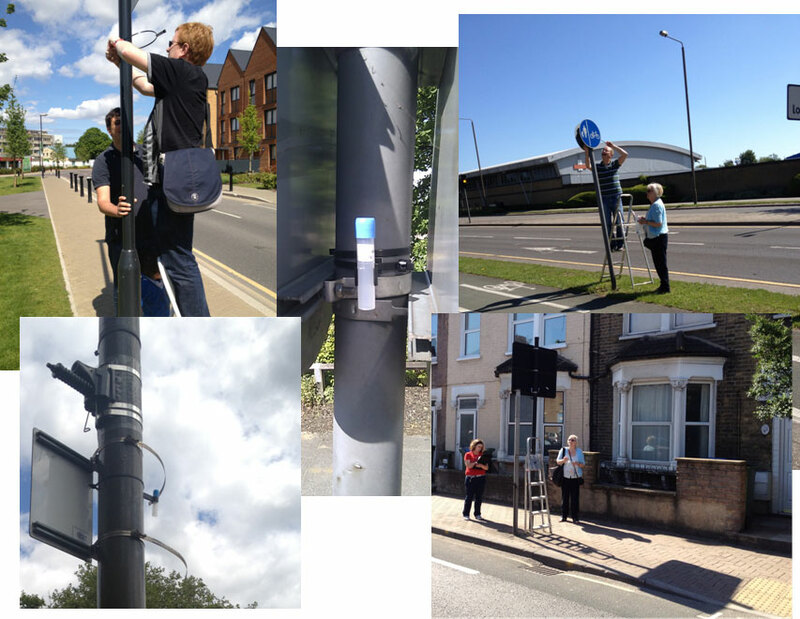 Last year we organised a conference: ‘Cities for Clean Air: London 2012’ – immediately prior to the London Olympics, and this year we organised a programme of citizen science – both in London and elsewhere. There were three groups that were part of the London programme: No to Silvertown Tunnel (Greenwich) – which you heard about earlier, Stop City Airport in Newham, and Friends of the Earth who surveyed the area around Gallions Reach in Newham. For the London programme we provided: over £1,000 worth of materials and equipment, staff time, information, co-ordination and assistance in whatever way was necessary for the three projects to complete successfully – which they all have. A couple of weeks ago, the results for Newham were presented at City Hall; this evening we heard the results for Greenwich. The Greenwich citizen science project is particularly inspiring because it genuinely engaged the community. There were 13 volunteers – 10 from Greenwich, 2 from Bexley and one from Lewisham. This is very good indicator of an active and vibrant civil society – exactly what is needed to stop the proposed Silvertown Tunnel. It wouldn’t be the first time a traffic crossing of the Thames was turned around. The Thames Gateway Bridge was canceled by Boris Johnson after a strong public campaign and defeat at public inquiry. Other road schemes have been stopped by residents – for example, the Salisbury Bypass. Clearly, the Silvertown Tunnel is more than a local road scheme – it’s already designated a national infrastructure project, and it would expand the present crossing from 4 to 8 lanes – a motorway. That will bring traffic blight to Greenwich and neighboring boroughs. It thelonger term it could see a motorway corridor spanning the capital – which would be a complete disaster for London. There are a whole set of measures which are needed at a regional level to tackle traffic: congestion charging, a workplace parking levy for example or similar demand management measures as they’re known. We also need to put in place infrastructure for a healthy city. We need to engineer health into London. That means for example, a dedicated cycle and pedestrian bridge spanning the Thames at Greenwich. What provision is there, at the moment for cycling? None. We need to make space for cycling. That retains the things which make Greenwich special, and promotes levels exercise – as part of our everyday lives – which are needed to maintain a healthy population. I would urge you, if you live in Greenwich, Newham ,Lewisham, Tower Hamlets or elsewhere, to join with No to Silvertown Tunnel and articulate your voices – because that way, you will be heard and this motorway crossing will be stopped. “No to Silvertown Tunnel” would like to thank Andrew Wood and the Network for Clean Air for taking the time to come to Greenwich this evening, and for the invaluable support he has given our citizen science monitoring project. Our seventh, and final, post will feature the remainder of the meeting with the public Q&A session. This entry was posted in News and tagged air pollution, andrew wood, chris taylor, citizen science, city airport, gallions, greenwich, newham, no2, silvertown on November 9, 2013 by Stewart Christie. Chris Taylor: And to follow on from that, regarding clean air and the effects of clean air on people, we have Simon Birkett with us. Simon’s the founding director of Clean Air in London, and he’s spent more than seven years campaigning against poor air quality, and he’s with us tonight to update us on the 2013 Year of Air. Was anyone aware that this is the European Commission’s Year of Air? No? Not many people, I don’t think, unfortunately. And also we’ll hear how London, how the UK are faring meeting their standards. Thanks very much, Chris, and thank you all for inviting me. Yes, 2013 is the European Commission’s Year of Air, which means that they’re going to come up with a package of proposals probably in early December. Commissioner Potočnik, who’s the Environment Commissioner, gave us a bit of a preview of that yesterday, which I’ll share with you. As Ian said, we’re worried about particles and gases, and within the gases component of air pollution there’s really only one molecule which is regulated, which is nitrogen dioxide. So there’s all the gases in the gases bit of air pollution, but there’s just this one molecule which is regulated, and for which there are World Health Organisation guidelines. And that’s important, because when the Mayor and others say ‘well, I’m not that worried about nitrogen dioxide’, they’re trying to single out one molecule in this whole gases component, and we need to look at nitrogen dioxide as being an indicator of all those gases, but also of the very fine particles which it tends to bounce back and forwards between. Last week, the UK published its results for 2012, and what that showed was that, broadly speaking, air pollution near the busiest roads in London is twice World Health Organisation guideline levels and legal limits. 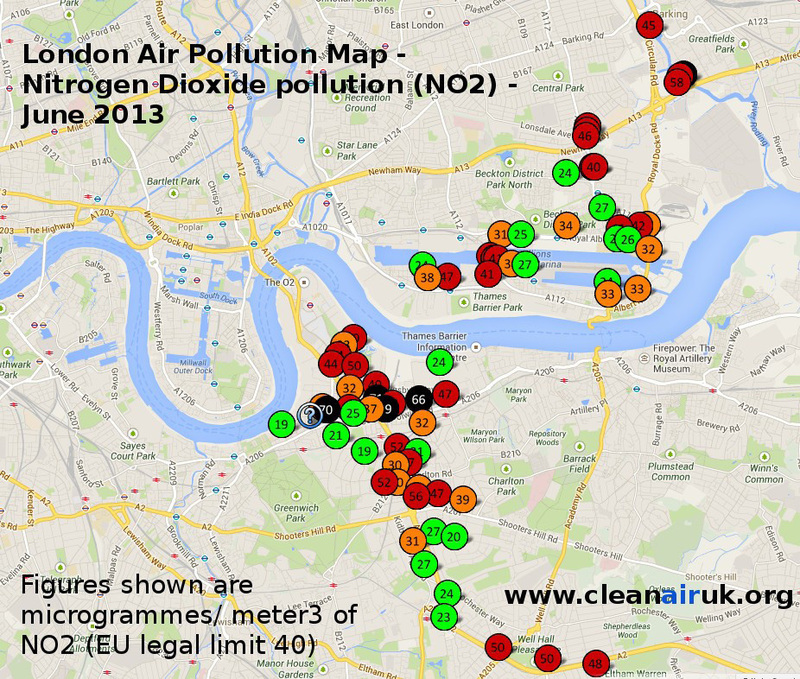 And London again is the most polluted capital city in Europe for nitrogen dioxide. For the particles, some of the Eastern European cities which are surrounded by coal-fired power stations are worse, but for the air pollution gases London is the worst. So it’s absolutely not right to say that we’re in this with a whole bunch of others. We are the worst, and it’s probably because of the vast number of diesel vehicles: we’ve got 8,500 buses, 22,000 taxis, etc. The government only admits to having 230,000 people in London exceeding the legal limit for nitrogen dioxide, and that’s at background locations and they steadfastly refuse to say what the number is near the busy roads that Ian highlighted. 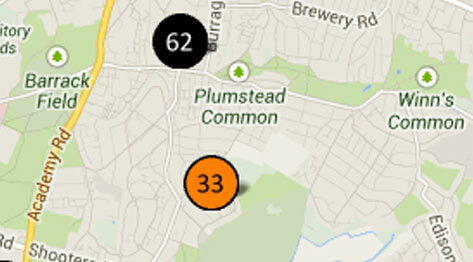 But this nitrogen dioxide problem is not going away. We’ve actually seen the data last week show that over the last 15 years, the long-running urban roadside air pollution monitors have shown no increase or reduction – importantly no reduction – in the levels of nitrogen dioxide. So this problem has been around and has been pretty static for about 15 years near the busy roads, and in part that’s because the government has – successive governments have – failed to control diesel exhausts. So we’ve now got about 50% market share of diesel vehicles, against about 10% ten years ago. Now, within Greenwich, there’s an app which Clean Air in London have produced, called the Clean Air in Cities app. Using the government’s own statistics, as at today, 7.2% of all deaths in Greenwich are attributable to long-term exposure to air pollution, that’s just human-made pollution. 93 deaths so far this year, and population weighting levels of the particles, which we’re also concerned about, are about 40% above the World Health Organisation guideline. 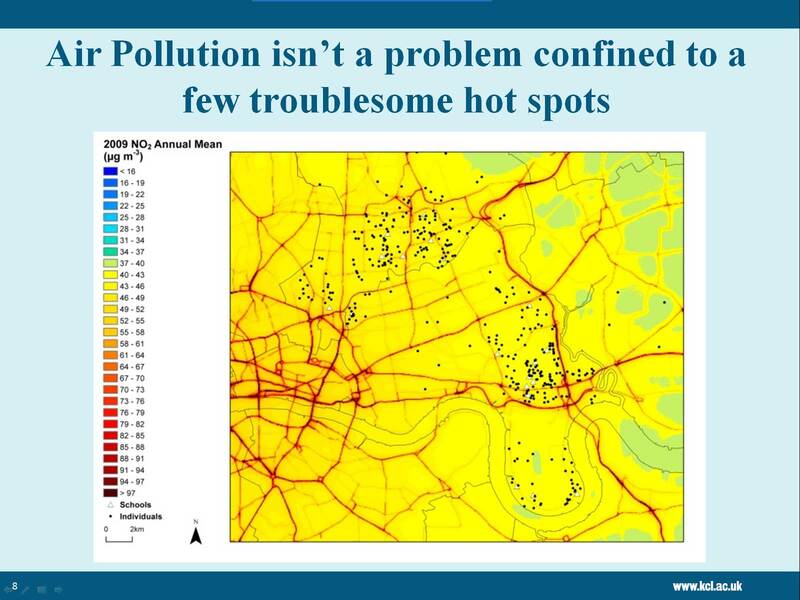 So be in no doubt that this is a big problem: air pollution. The very good news, is that – there are several bits of very good news – but the first bit of good news is that there are very very powerful laws in place to protect people. They may be breached by a country mile – by a factor of two – but actually the fact that they’re breached does not give the Mayor or others carte blanche to keep breaching them. The European Commission will we hope start infraction action, legal action against the UK in the next few months. Client Earth has won a case at the Supreme Court, and that’s been referred to the European courts to try and enforce these laws in the UK as well as asking the European Commission to help us. Those laws are very very important. You only have to find one spot that is below this legal limit of 40 micro grammes per cubic metre, and it cannot go above that 40 level. Last week I submitted a nineteen-page letter of complaint to the European Commission about the removal of the M4 bus lane, because guess what? They remove the M4 bus lane, which Sian will object to, I’ll probably object to, but in air pollution terms my biggest objection to it was that they made not one single effort to mitigate the shift in diesel pollution from the outside lane to the inside lane, close to houses. They made no effort to mitigate the increased air pollution for many hundreds of people near that M4. And what I highlighted in particular, is that there were 35 locations, 35 houses where pollution was going from below this legal limit to above it. That is an absolute black-and-white breach of European law, which is totally unacceptable and Clean Air in London has asked the European Commission to investigate. And the top three solutions from Clean Air in London, which I told the BBC about a month ago, were: first, we need to catch up with Berlin, which banned the oldest diesel vehicles, in fact nearly four years ago. Second, we need to give taxi drivers choice. Currently the Mayor forces taxi drivers to buy one or other of two diesel vehicles. We need to allow taxi drivers to buy smaller petrol vehicles. And we need to retrofit filters to thousands of London buses, not just a few hundred as the Mayor proposes. And what you should all be asking, I would suggest, is why are you in Greenwich not getting cleaner buses, which is what for example Putney’s got by making a fuss about air pollution. Why aren’t you getting it? Why aren’t we getting it in Central London? The Mayor’s got really a very appalling track record on air pollution, and in particular – by the way, Clean Air in London is a cross-party campaign, it’s very rude about the previous government, so it’s very even-handed! – but the Mayor has faults in two areas, I would say. So I would not trust him to say that he’ll do something to sort it out. He’s pursued vanity projects, like the Boris Buses and things, if you look at his bicycles, they’re hugely over-engineered, they’re sort of like Rolls Royces – much more expensive than the comparable systems that you’ll see if you go to Brussels or anything like that. And the ‘airline’ [Emirates airline: cable car from North Greenwich to the royal docks] I think we’d all agree is a joke. But he’s also taken backwards steps on key measures like delaying phase three of the Low Emission Zone, scrapping the westward extension of the congestion charge; you cannot trust him to tackle road transport problems. The government of course is even worse. I’d characterise some of the senior cabinet ministers as free market anarchists, who wanted to make changes to the local air quality management system recently, which many of us opposed, which would result in the scrapping of all monitoring of local air pollution across the whole of England. It’s just unbelievable what they’re proposing. They don’t want to have anything to do with this problem; they want to brush it under the carpet. Now the last thing I’ll say is that – I think Chris said it very well – it’s lovely to say ‘let’s have a bridge’ or ‘let’s have a ferry’ at Gallions Reach or wherever it is; let’s have these lovely things and with the wave of a wand it’ll solve all our problems. We’ll have the existing traffic and much more space. Well, that’s a nice bit of spin. But I’m very persuaded by the evidence you’ll hear from John and others that what happens is, you build these things and they fill up. And you end up with more traffic than you actually had to start with. So it doesn’t reduce the problem, it actually makes it worse. And I think what we need is that those who are in favour of river crossings – and there may be a way to do them – have to be honest about how they’re going to mitigate the increases in air pollution that will arrive with these crossings. So they talk vaguely about road pricing or they’ll consider Low Emission Zones or something like that. They absolutely need to be pinned down. They can’t have it both ways; they can’t say ‘we’ll have a river crossing’ and ‘we’ll deal with the problems later.’ They must be open and honest about how they will mitigate the additional traffic that will pour into those crossings. And if they did that, and told people up and down the next five bridges into Central London that they’ll all be paying tolls in order not to shift the traffic from a tolled bridge here to non-tolled bridges further in, then I think there’s be a lot fewer people in favour of new river crossings. So what we need is bold action, particularly to eliminate diesel exhaust from the most polluted places by 2020 – that’s the Clean Air in London vision. We need to get the Mayor and the other politicians behind this, and I think if we do that, through a mixture of political will, behavioural change and technology, we really can show the whole world how London can lead the way as it did sixty years ago in tackling air pollution. We are the only mega-city in Europe: if we can crack this problem, we really will do something special and I look forward to that opportunity. Thank you. “No to Silvertown Tunnel” would like to thank Simon Birkett for taking the time to come to Greenwich and discuss issues of air quality with us. Subsequent posts will feature the remainder of the meeting and presentations from John Elliot, Sian Berry and Andrew Wood, along with the public Q&A session. This entry was posted in News and tagged air pollution, air quality, chris taylor, clean air in london, no2, simon birkett on November 5, 2013 by Nikki Coates. Sometimes when we get given numbers on maps, it doesn’t mean a great deal and it doesn’t convey to you the sense that air pollution in London is extremely bad. So I thought I’d start this talk by making it a bit more tangible by showing you an image. This is a picture taken in March this year. So this is one of those periods where it’s cold and you get higher concentrations of nitrogen dioxide. And you can see this brown – almost like a cloud hanging over the whole of the city – and this is a cloud of nitrogen dioxide. So forget the number, forget the size of the number though that is important: you can see it from a distance. If you were walking down that street you wouldn’t be able to see it at all, it’s an invisible gas, but from a distance looking across London you can actually see it. And that’s what we all live in. And I’m not immune from this; I’m not from Greenwich although I’m from New Cross so I’m also living under that cloud. But it’s actually a little bit worse than that: I can show you a picture that was taken earlier in the day. So this was taken in the late afternoon, you can see that the brown is rising above Canary Wharf. But this was taken in the morning. So this is now a photograph taken from Woolwich looking out across the city. 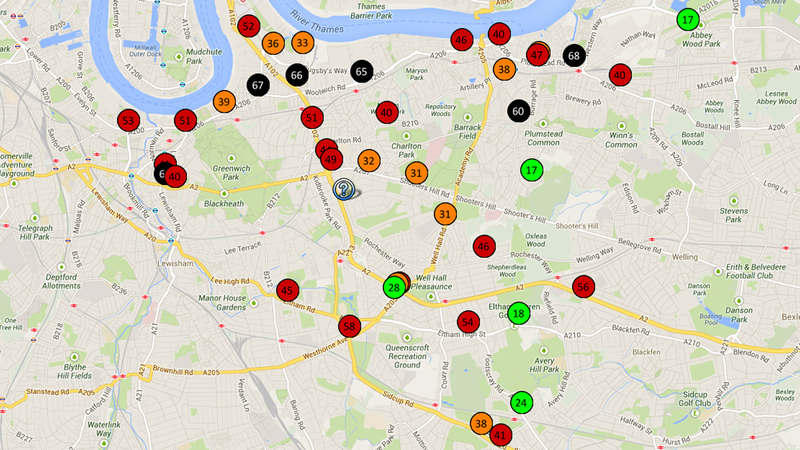 And you can very clearly here see just how bad the nitrogen dioxide pollution gets in the cold winter months in London. And this is another thing; sometimes people forget this. There’s this concept that when you emit pollution from vehicles into the air, it just sort of disperses. And there’s a lot of air so we don’t need to worry about it. If you look at this picture you’ll see that there’s actually quite a sharp line and that’s because in the winter the air’s quite cold, it’s quite stable. So effectively, on a cold day in London, you have an invisible ceiling on the atmosphere at about 300m. And now pause and imagine that all of the fumes from all of the vehicles in London are filling up an area of air that has an effective ceiling. It’s not dissipating out. Later in the day it begins to as the atmosphere warms up, but that’s why in the morning the air pollution gets particularly bad, more so than later in the day. So you can see it. And if you have a number from an NO2 diffusion tube here, they would be black; it would be in that black sort of range. And then I pose some questions. And these are the sort of questions which are often raised when people say air pollution’s quite bad and people know it is, but you know, you can derail people’s thought processes. The first one is: all right, we’ve got air pollution, but it’s not as bad as it used to be. And they’ll always take you back on some historical journey back to the nineteen-fifties, and they’ll show you this picture – a very famous picture – of the 1952 smog. And clearly during the smog, things were pretty bad. The one that occurred in December 1952 killed four and a half thousand people within five days, so clearly something had to be done. Sound familiar? It is a little bit familiar to the situation today. But there are lessons we can learn. So if you look back to 1952 you simply ask the question ‘Who died, during that week?’ And what this is looking at is a few areas within Inner London, and it’s looking at the increased ratio of people dying, stratified by age. And this is really, really important. 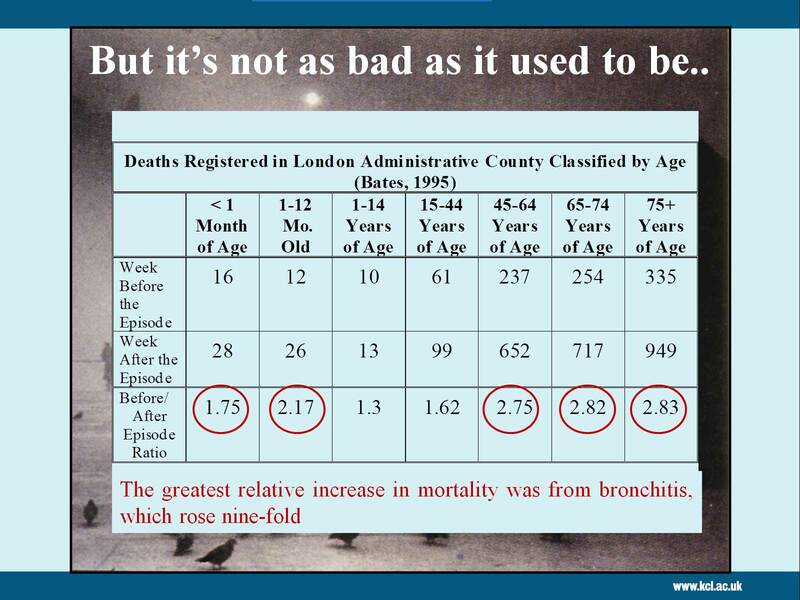 Because when you hear about the London smog and how bad it used to be, you’re always told that it was the very old, ill, infirm people who died. And that’s certainly true, if you’re willing to accept that ‘old’ is over the age of 45 – because if you look here you can see a two-fold, three-fold, doubling of death rates within those age groups. And here’s the thing you’re never told: it’s the other side. The death rate also doubles in children under one year old. So the sensitive populations, the populations who were suffering the most during this air pollution episode, were the elderly, those entering their retirement age, and the young. And you know what? That doesn’t change. 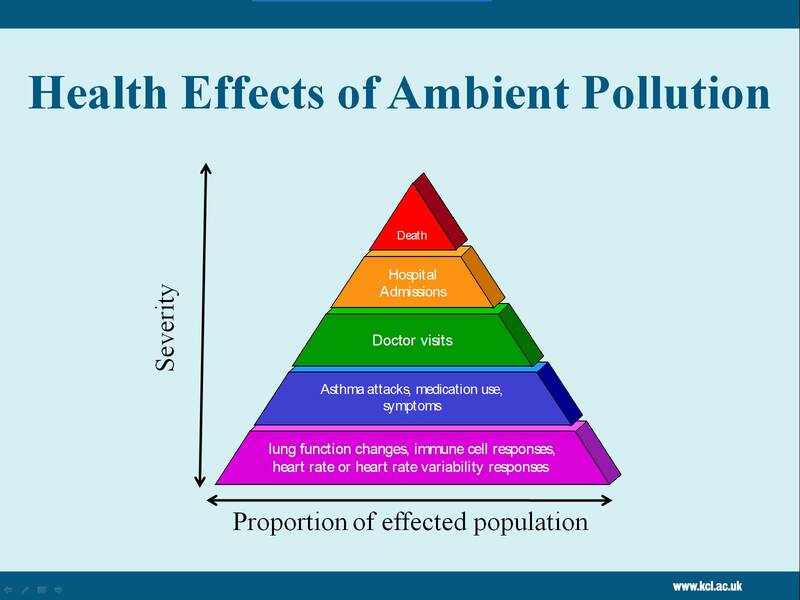 So if we’re having an air pollution debate, we should be considering those members of our population who are the most vulnerable. And that does include our children, as I shall point out in the next slide. Things have changed. So as the smogs of the nineteen-fifties were caused by coal burning – we don’t really have coal burning in London any more. I mean there are some people who burn bio-mass, […] which they shouldn’t really do, but now much of our pollution comes from traffic. And this is again an point where people get a bit confused, because what are we really talking about? Because there are lots of different types of pollution. We have particles – particulate matter, small particles emitted into the air, which are intangible, you won’t see them. If you talk about something having particulate matter 10 microns, that’s about the size of e. coli. If you’re near a road, particles which come out of an exhaust pipe are about 100 nanometres; that’s the size of the influenza virus. So you’ve moved from a visible smoke to an invisible killer. It’s still there, it’s just changed its nature. So then we have all these other things: we have carbon monoxide, nitrogen dioxide – which we’re spending most of our time talking about today – we have black carbon, then we have a whole host of other things that are in this toxic brew. We have polyaromatic hydrocarbons, we have VOCs, we have metals, in fact diesel exhaust contains one of the most carcinogenic compounds that has ever been identified. So it is quite a complicated mix. So we have all of these things we have to consider, and then you have to ask: where they come from? 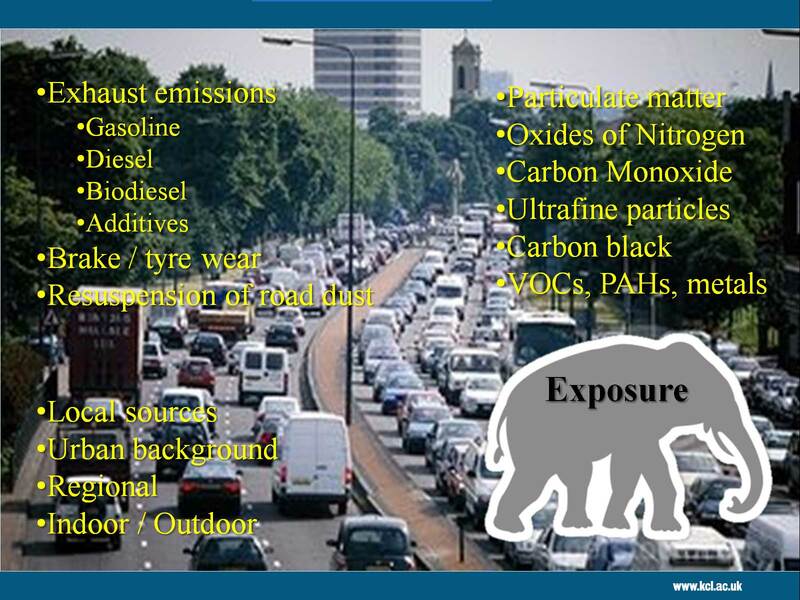 Because the air out there’s a mixture of different sources: you have diesel vehicles, gasoline vehicles. Even if you got rid of all of the exhaust emissions we’d still have pollution come from brake wear, because when you brake, big plumes of copper are released into the atmosphere. You also have resuspension of lying road dust. So it’s a complicated picture, and then there are other things. So where does it come from? Well in London, you could really take a lot of that information and condense it down and say ‘there are lots of things here’, but there is a common theme, and it’s largely traffic-derived. In London it’s the traffic-derived pollution we’re concerned about. And many of these things actually vary together, so that as NO2 goes up, you tend to see an increase in the particles in the air, you see an increase in the black carbon. It’s traffic, and particularly it’s diesel traffic, diesel vehicles and the preponderance and great density of diesel vehicles on the road. This is the elephant in the room; it’s called exposure. Just because the air out there is polluted, doesn’t mean you’re all exposed to it to the same extent. How much do you actually breathe? Depends on how much you ventilate – if you’re running you’re going to breathe more than someone who’s walking quietly down the street. But the reason I’ve highlighted exposure here is, let’s think of a group of individuals who spend more time outdoors than adults? Children. They have a greater exposure because they spend more time outdoors. They have higher ventilation rates – their breathing rate’s faster than an adult’s. So if they’re outside, they breathe more of the air than you do, and they have smaller lungs, which are developing. Which means that the amount of toxins entering their lungs is greater per unit area of lung. So a child outside, if it’s 70 micrograms per metre cubed, is getting a bigger dose of the toxin than an adult in the same environment. It’s one of the reasons why children are a sensitive sub-population. How serious is it? Well, we’re kind of fortunate in a sense, that this has been reviewed by the government. 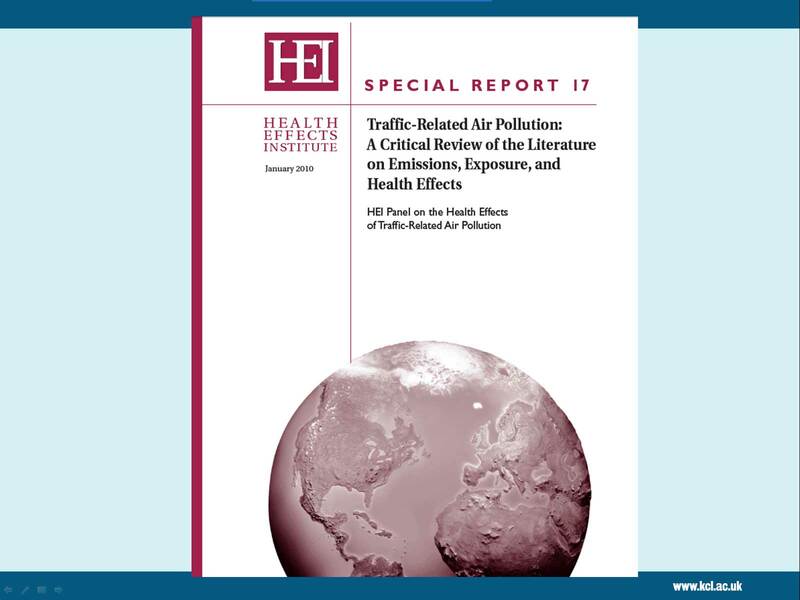 This is a report published in 2010, by the Committee on the Medical Effects of Air Pollution. This is the figure that the Government itself will quote to you about the magnitude of the air pollution problem. In fact this is the figure that they quoted in a very recent House of Lords debate, which was raised by Lord Lawson. In 2008, the UK population lost 340,000 years of life, so think about everybody in this room losing an amount of their life in relation to the amount of the exposure. But you can think of it another way; if you take that 340,000 and you think about the most sensitive individuals, it means there are 29,000 premature deaths in the United Kingdom per year arising from particulate pollution. That is a huge number. It’s greater than the number of people dying from obesity-related illnesses, it’s greater than the number of people dying from alcohol-related illnesses. It’s only second to cigarette smoking within the United Kingdom as a cause of premature mortality. So this is a public health disaster, which needs to be dealt with. And it’s not just a disaster on a personal front; economically if you have a vista which takes in the future, and not just the next immediate four-year period of time, this is a huge burden on the health system. We’re meant to be protecting our investment in the health service by improving the public’s health – this has to be one of our major targets. I’ve given you information about death because death statistics are very popular, but the problem when you look at death, is that’s just the tip of the iceberg of health effects. So if we have 29,000 premature deaths, that’s going to represent a massive increase in hospital admissions. There’ll be more people visiting doctors: asthmatics, people with Chronic Obstructive Pulmonary Disease, people with cardiac disease, having to see their doctors, having to attend the GPs’ surgeries. We’re going to have increased medication use; so we have cost to the health service all the way down here. And then right at the bottom, in this purple segment, is what’s happening to everyone in the entire country, just from being outside near a road on a polluted day. Now one of the things I do, is I take happy Scandinavian medical students, from a place called Umea in the far north of Sweden, and I put them inside chambers and I expose them to diesel exhaust at the concentration of diesel exhaust that they would experience if they were in London. I can’t do that study in London, because by the time you’d arrived at my laboratory for me to expose you to diesel, you’d have had more diesel than I’m about to give you as your challenge. If I look at their lungs, their lungs are inflamed. Their lungs react immediately – you can see that it has a physical effect on their airways. Another thing that I should make a point of – because we often get completely focussed on roads – and a lot of people in the rest of the world don’t understand that because most people in most cities in the world don’t live slap-bang next to roads. We do, because of the nature of London. 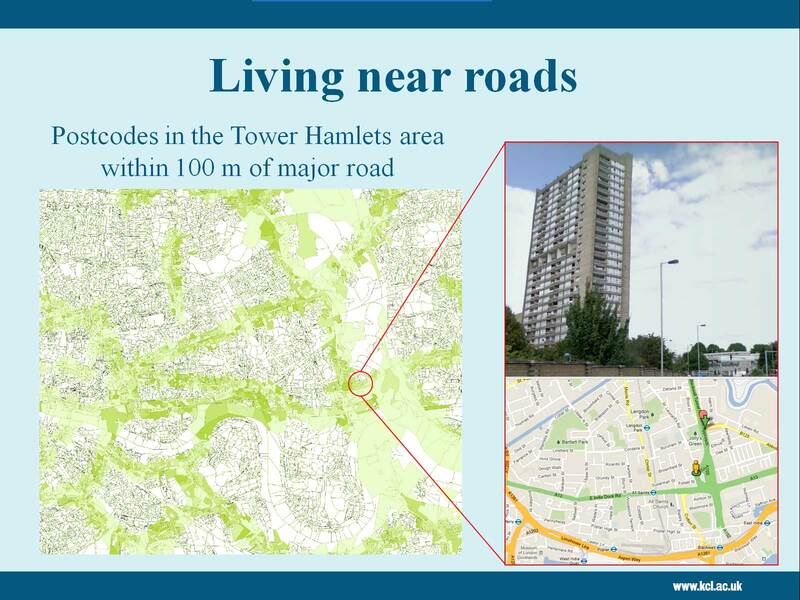 I do a lot of work in Tower Hamlets and Hackney, and this just illustrates the number of postcodes within 100m of a major road. And that becomes important in the next slide. This I think, is the most important figure. If you can take this away with you, this would be the most important thing. 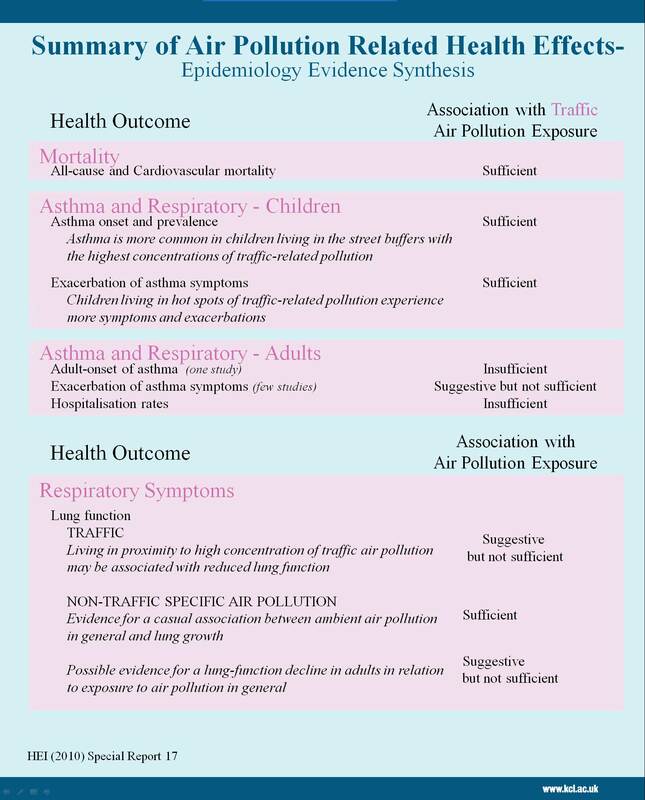 I’ve been studying children’s respiratory health in Tower Hamlets and Hackney for the last five years. This year’s going to be the last year we’re doing our study. Each of those dots is an eight to nine year-old child. If you’re looking at this map, and it’s yellow – and this is a map from 2009 – that means that that child is living in an area with an annual level of nitrogen dioxide over 40 micrograms per metre cubed. That means it’s not a hotspot: it’s not that one tube on that one corner, it’s almost the entirety of Hackney, and over 90% of the area of Tower Hamlets. 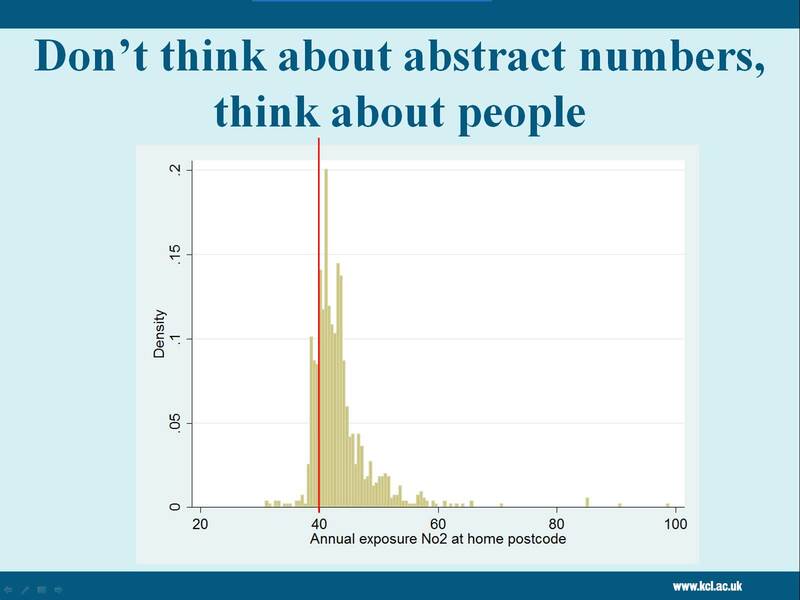 In this slide, there’s only one child who lived in an area where the air quality of NO2 was legal, and he was over here. So let’s put a number on that: I did this off the top of my head, and I think I can do it again. Tower Hamlets and Hackney have a combined population of about half a million. 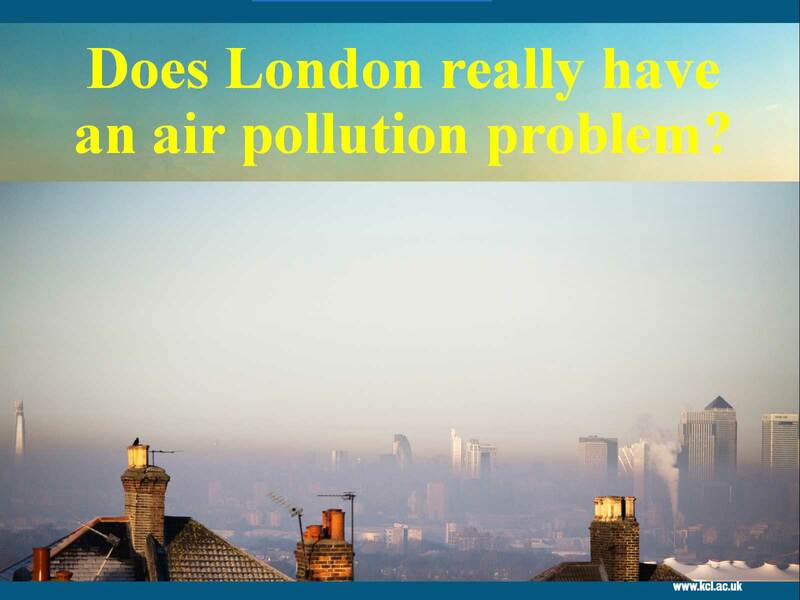 If I was to assume, conservatively, that 75% of people in those boroughs lived in a high pollution area, it would mean that about 375,000 people in those two boroughs live in an area of illegal air quality – in that brown cloud. And that is just an unacceptable reality at the present moment in time. Don’t think about abstract numbers; think about the people. It’s about the people who live in these areas, and people forget that. I just want to say it’s not a new problem. If you think ‘oh, he’s gone on about diesel exhaust, and we’ve been told diesels are good’. We’ve known diesel is bad since 1956. 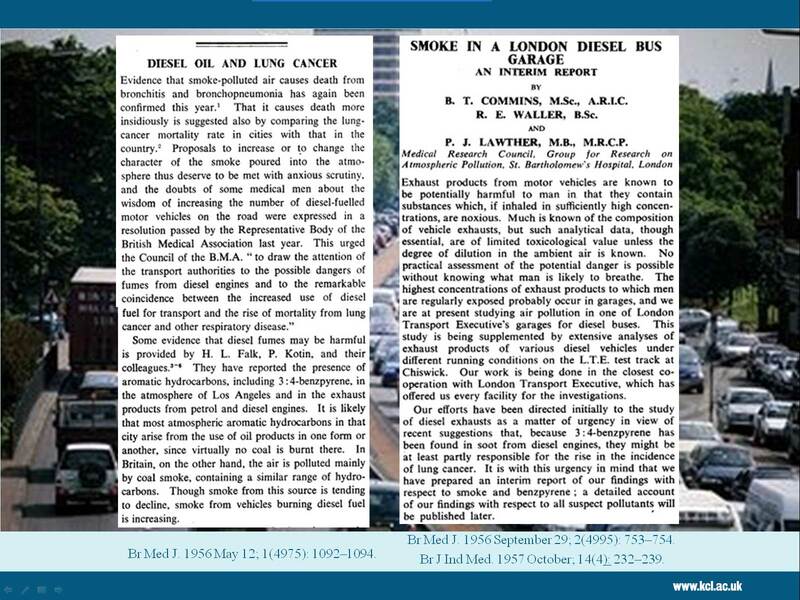 The first reports were published in the BMJ saying diesel was bad for health a long, long time ago. It’s not a new story, it’s been around for a very long time. And in my area, we are completely surprised that people endlessly say ‘well, we didn’t know’ because we’ve been telling you for years. And then finally: you don’t have to take my word for it. This is just one report, but it’s a very important report. The HEI is a US-funded institution, half funded by the government, half funded by industry. It’s meant to give completely independent, legally sound summaries of air pollution and health advice. And they published this report, again in 2010, to review the evidence. And I’ll just give you this final point, because this is something you can wave in front of people, and you can say ‘it’s not just a few scientists who have a vested interest in their next research grant.’ This has been thoroughly reviewed. 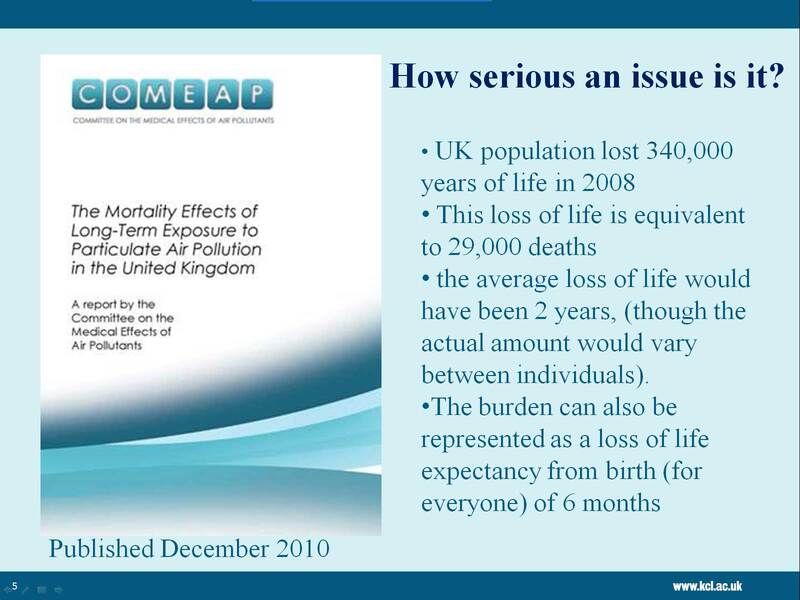 There is no doubt that being exposed to high levels of air pollution causes premature mortality. This is one of the most robust, repeatable pieces of scientific evidence there has been in the last 25 years. There’s no doubt that if children have asthma, it makes their asthma worse. No doubt; and we’re allowing our children to grow up in a city with unacceptably high air pollution. And also, and increasingly, I now believe that there’s no doubt that children who grow up in polluted areas have stunted lung development. Their lungs don’t develop properly. We’re seeing that in our children in Tower Hamlets and Hackney. Their lungs at the age of nine were already smaller than they ought to be. And that’s a burden that they’ll carry with them for the rest of their lives. “No to Silvertown Tunnel” would like to thank Dr. Ian Mudway for taking the time to come to Greenwich and discuss issues of air quality with us. Subsequent posts will feature the remainder of the meeting and presentations from Simon Birkett, John Elliot, Sian Berry and Andrew Wood, along with the public Q&A session. 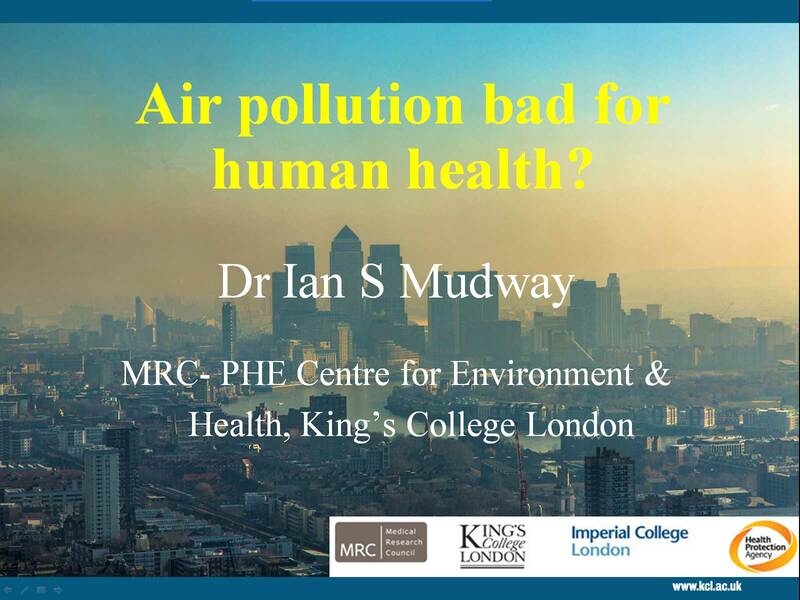 This entry was posted in News and tagged air pollution, chris taylor, Dr. Ian Mudway, greenwich, Kings College London, no2, public health, smog, woolwich on November 4, 2013 by Nikki Coates. Well, good evening everybody. I’m very, very pleased and surprised to see so many faces here tonight. Hello, and welcome to this public meeting arranged by the No to Silvertown campaign. Many, many thanks to all of you for taking the time to be here this evening. As you may be aware, the proposed Silvertown Tunnel is intended to be built not very far from here. As a group, we are already concerned about the air quality in the area, and so we are worried about the potential impacts such a tunnel may have. 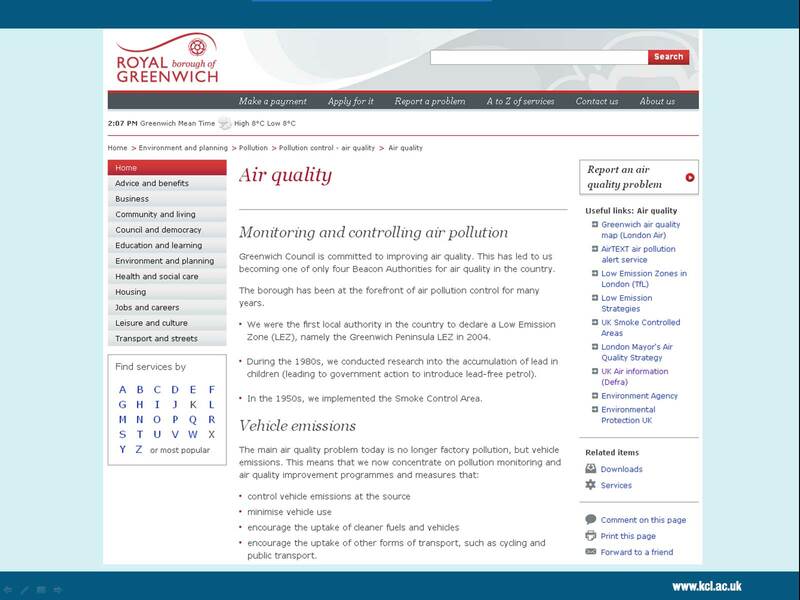 We’re going to first talk about our experiences monitoring air pollution around the borough of Greenwich, and then we have guest speakers to give short talks about their areas of expertise, and to discuss the effects a new tunnel would have on our local community, if it were to be built. First we will hear from Stewart Christie and Darryl Chamberlain about the work we do as the No to Silvertown Tunnel campaign, and our citizen science project, and then we will hear from Ian Mudway, lecturer in Respiratory Toxicology at Kings, Simon Birkett, founding director of the Clean Air in London campaign, John Elliot, an independent Transport Consultant, and Sian Berry, transport campaigner at the Campaign for Better Transport who also leads the campaign Roads to Nowhere. I am sure you are going to have many, many questions as this is something that people have many different views upon, however we hope the presentations will cover the majority of the questions you may have. So we would ask that if you could try to hold on to any questions, any ideas, any thoughts, until the end and we are going to have a nice, big Q&A session for a while, open to everybody. Also, you should see a card on your seat which has all of the contact details for No to Silvertown Tunnel. Please have a look at the website, you can see it scrolling behind me with all of the data and information we have gathered. Finally, you may have seen some clipboards being handed around. If you would like to hear more about the project, please leave your contact details. Also, there is a box, and we would really, really love it if people who had skills, time, or ideas to contribute, or to tick to say they are interested in becoming more involved in our campaign. So, thank you very, very much for turning up tonight. I’ll hand over to Darryl and Stewart to give us a presentation on our citizen science project and the No to Silvertown campaign. Hello. I’m Darryl Chamberlain, one of the people who started this campaign. Firstly, I’d like to thank you for giving up part of your evening. It’s really appreciated. A quick word first on what the Silvertown Tunnel actually is. It’s a proposal that has been around in various shapes and forms for quite some time. 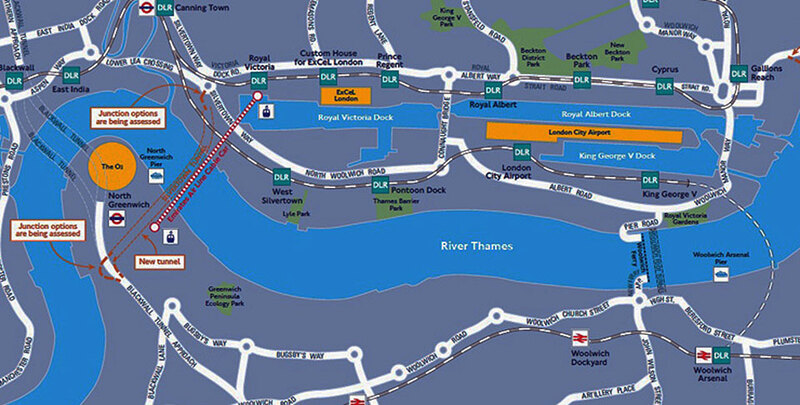 The current plan is to link the Greenwich Peninsula with the Royal Docks. There will be a road tunnel coming off the A102 at Tunnel Avenue and it will go under the cable car, and emerge at the Lower Lea Crossing roundabout, just over the water in Silvertown. If it gets built you will be able to drive through it. You won’t be able to walk. You won’t be able to cycle. TfL’s consultation last year was packed with leading questions. It was, more or less, would you like to solve all of the traffic problems in your area? One of the questions was, “How many times do you cross the river by road?” That has nothing to do with whether or not I want more traffic coming down the motorway that goes through my community. You would have hoped that our Council would have supported our community. You would have hoped that our MP would have supported our community. In fact, what actually happened, was this. 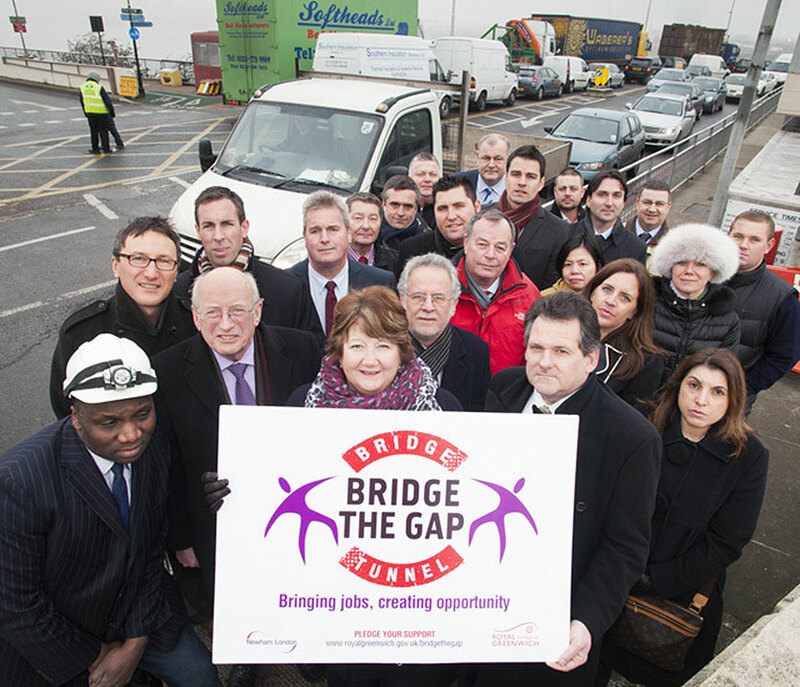 That’s the leader of Greenwich Council, the local MP, some business leaders, and other people they got together to support their campaign to build this thing. Greenwich publishes a weekly newspaper which featured this campaign in eight successive issues. There was no real room for open, honest debate. I was talking with Adam Bienkov about this in December, when TfL launched this consultation, and we thought the council should be told where to stick this campaign. Nobody else locally was actually campaigning against Silvertown – people were maybe scared of the power of Kent drivers. We don’t know. So, we launched a petition which went into the consultation. We had 373 signatures by the time the consulation closed, and we managed to get quite a bit of attention in the local media, for which we were very grateful. We also asked the local residents to ask questions at a local Council meeting, and in 28 questions Greenwich Council could not offer a single shred of evidence to justify its support for Silvertown. I put a Freedom of Information (FoI) request to Greenwich about this and ten months on they are still refusing to offer up their evidence. In fact, Greenwich said it is just going to leave Boris Johnson to come up with the answers instead. I actually asked Boris myself at the State of London debate this year and he didn’t come up with anyting either. He just blustered. So, after all this, what next? They measure ambient concentrations of Nitrogen Dioxide (NO2) in the air. So, all we needed were some volunteers, some cable ties and some stools to stand on. The idea was that we would leave these on lamposts, a couple of metres up so they wouldn’t get nicked – we did put one outside here and it did get nicked – and then we would leave them up for four weeks. Spotted Darryl up a lamppost in Eltham today. Still trying to work out why. New fitness regime or some other mystery mission.? Here are some young, fit and healthy volunteers putting the tubes up. The volunteers who put those tubes up are sat around the hall now, so thank you very much for taking part. After four weeks we took them down, sent them back to the lab, and then got the results back. Basically like your old holiday snaps. So we did this, thirteen of us on a sunny Sunday afternoon in June. We chose forty locations along the A102 and A2, which form the approach to the tunnel, and also along the A206, which runs trough Greenwich and Charlton. One other thing I should say about the tubes is that it was part of a bigger funding package for other campaigns north of the river, about Silvertown, and for the Gallions Reach bridge as well. Some tubes were also put up around East Ham, Beckton and North Woolwich but this meeting is about Greenwich, and about Silvertown. So, we put 56 tubes up and four weeks later we took 53 tubes down. We then got these results from the lab. These won’t make much sense to you, and they didn’t make much sense to any of us either, so Stewart created this map. Many of you may have seen an earlier version of this map which we have changed slightly in the last 24 hours. As you may know, 40 micrograms per cubic metre (40 µg/m3) is the EU limit for NO2 pollution. The circles you see in green here are the areas that are below 30µg/m3. Those in orange are the ones that are below 40µg/m3. Now, below 40µg/m3 is still an issue for public health which I think will be touched upon later on in this session. The red circles that you can see are the areas that are between 40µg/m3 and 60µg/m3 – that’s 50% above the Eu maximum. Those in black are the ones that are above 50% of the legal maximum, 50% above the legal limit. As you can see, we were slightly surprised by the results. The locations we put these tubes in weren’t actually on the A102 or the A2 itself, because that isn’t actually publicly accessible. So, we targeted side roads and we targeted areas that are around the main route itself. Now, as you can see from the map, around the top where there would be new approaches, we got some pretty high red results. But, around the centre here along the Woolwich Flyover, we actually have some very high ones – 71s, 69s – and, interestingly, along the A205 itself, along the bottom road. 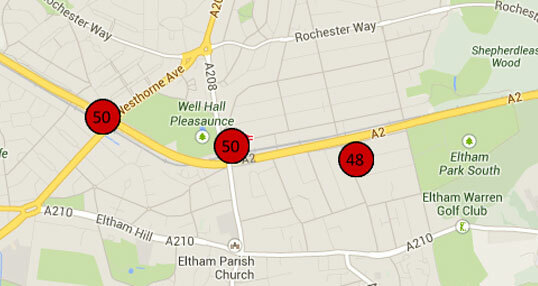 As well as that, we had some high readings further back, down by Eltham. As you probably know, around here, the road narrows and there are less carriageways than up top. There are many tailbacks down the bottom here in Eltham and we think this is one of the reasons there were such high readings. At the same time that we were doing our monitoring experiment we discovered that Greenwich had been doing their own monitoring experiment since 2005. I put an FoI request in to the Council and, after a bit of hassle, I did get their results. We have our own results from [June] 2013 and, on this next slide, you can see the results of Greenwich’s monitoring, for the entire borough, for the previous month. You can see that the red spots, and the black spots, correlate with our own findings. Now, some of you may be thinking, “well, these results aren’t too high, they aren’t too bad”. You have to bear in mind that NO2 levels change according to the month of the year, the season. This result from Greenwich, for 2012, shows Banchory Road and you can see that there is a dip in the spring and summer months. The Greenwich map I have just shown you is from May, ours was from June, and you can see that seasonally it is a bit less. 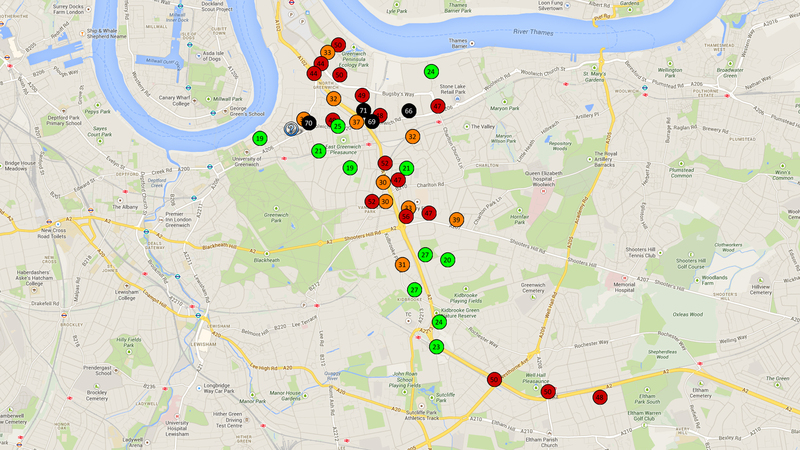 So, from Greenwich’s data, I have mapped out for tonight the results from December 2012. As you can see, it’s slightly different. There are far more black readings, there are far more red readings, there are only a few below the legal maximum. If we compare you can see the difference. In fact, there is only one green spot, one result below 30µg/m3. Interestingly, some of Greenwich’s results have “background” areas. There is a background area here that is Shrewsbury House in Shooters Hill, which has no main roads beside it, and has a figure that is approaching the maximum. It goes to show that the traffic levels across the borough do affect areas that you wouldn’t expect. All of the data is available at our website, which I hope you’ve had a look at already, and if you haven’t, please have a look. You can download anything, you can look at your own area, you can look at the results going back to 2005. I hope that explains why we are so concerned about our own readings. Subsequent posts will feature the remainder of the meeting and presentations from Dr. Ian Mudway, Simon Birkett, John Elliot and Sian Berry. This entry was posted in News and tagged chris taylor, darryl chamberlain, eltham, greenwich, greenwich council, no2, pollution, public meeting, silvertown, stewart christie on November 4, 2013 by Stewart Christie. Over 100 people attended our meeting at the Forum at Greenwich on 16 October. People who couldn’t make the meeting could follow it live on Twitter using the #silvertown hashtag. Here’s what was being tweeted. 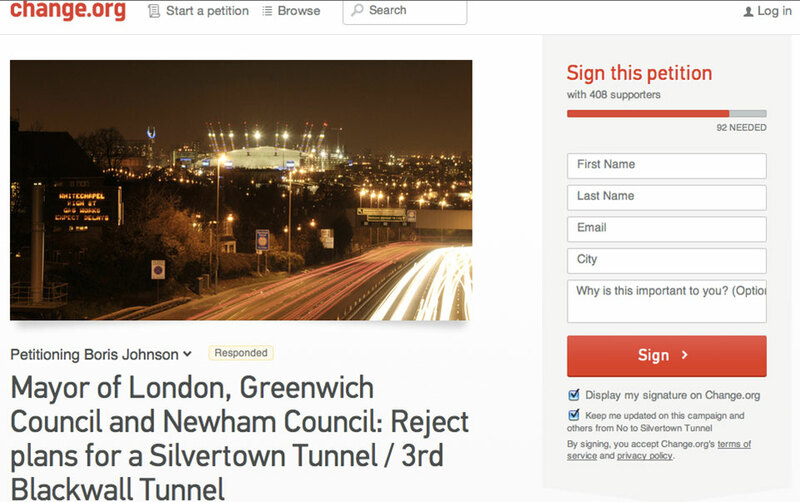 This entry was posted in News and tagged greenwich, no2, pollution, public meeting, silvertown tunnel on October 18, 2013 by Clare Griffiths.